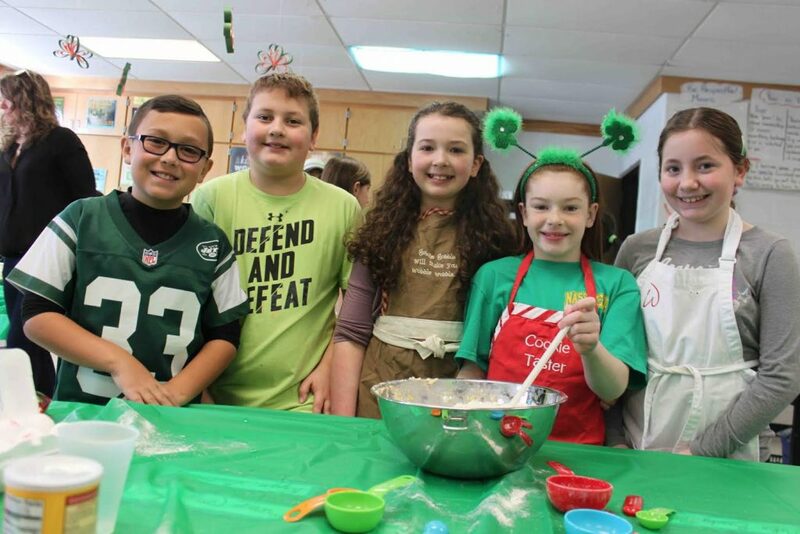 Fourth-grade students in Kathryn Comiskey’s class at Nassakeag Elementary School recently sifted, stirred and measured baking ingredients while deploying their understanding of measurements and fractions to create loaves of Irish Soda Bread for the St. James Soup Kitchen. Working in small groups, the students first created the batter using traditional measuring tools before problem-solving how to make the same recipe using equaling fractions when the proper tools are removed. The lesson not only reinforced the grade level’s math curriculum but also ties into the school’s character education program as it encourages students to be positive role models in the community. Photo caption: Fourth-grade students in Kathryn Comiskey’s class at Nassakeag Elementary School used their math skills to create loaves of Irish Soda Bread for the St. James Soup Kitchen.